Stewart Brand wrote a wonderful book called “How Buildings Learn: What Happens After They’re Built” . It is a fabulous and useful manual, well worth reading and re-reading if you have any relationship with a building. The book presents buildings as predictions. The architect or owner of a building has an idea in their mind of what they want a shelter to do, and they build the structure upon these expectations. They might begin with the idea of a family, and then design for what they think their family will do. Or they might design it for a company, or a church, or a community. Trouble is, the future doesn’t usually work out the way we expected. Our family may be bigger, or smaller than we expected. Our church may whither, or move, and the building bought by a grocery. Retail stores go through a parade of very different tenents. So buildings — good buildings — have to adapt to different uses over time. The best buildings are ones that are incredibly flexible for many different uses. This flexibility, this adaptability, Stewart calls “learning” and it permits a building to survive. The unadaptable ones are torn down. The result is that the classic buildings, the ones we call great because they are old and venerable, are actually the ones that are most adaptable. In other words those buildings learn the most. Even small residential buildings, the ones that have no names, are often the most adaptable. The organic nature of changes made as buildings adapt to different families, new uses, and new technologies is what gives old cities and neighborhoods much of their charm. We tend to cover up these changes in expectations over time, so that buildings often pretend that they have not changed their minds (like some people). But every now and then, there’s a building that doesn’t hide its journey through time. 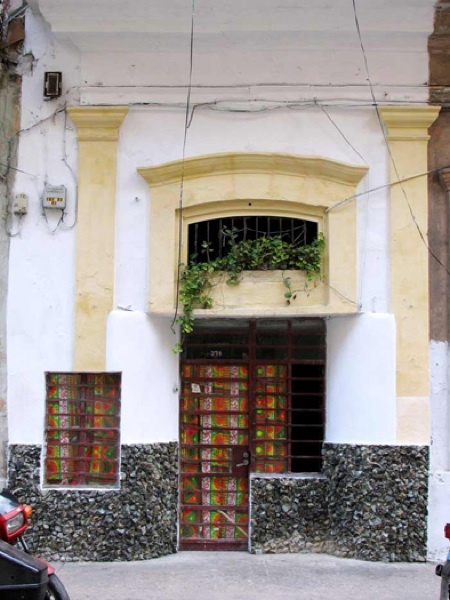 When I saw this picture of a house in Cuba, my first thought was: This is how buildings learn! This building has seen a lot. And despite getting some things “wrong” in the past, it’s serving well in the present. The main difference between this home and many others, is that no one has tried to erase its history.